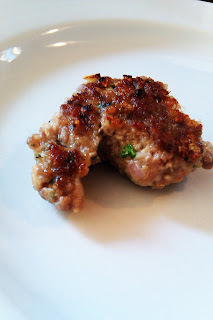 A couple of weeks ago I realized that my 'go to' frozen meat balls from Trader Joe's had things in them that I don't want to eat and don't want to feed my daughter. "Well Crap!" I thought to myself. So I decided to make my own and freeze 'em up for the same uses; One of them being popping them in a 350º oven for 30 minutes and packing them in my daughter's lunch. Put all of the ingredients in a large bowl and blend them well with your hands. To test for seasoning, make a test patty by frying up a little bit in a Medium-high pan. Make a test patty to check for seasoning. If you feel that you want more salt or garlic, or anything really, this is your time. When all is well, start rolling. I use a 1oz. ice cream scoop to assure that the meat balls are the same size and will cook evenly. After you scoop the mixture onto the tray, roll the balls in your hands to firm them up. Use a 1oz. 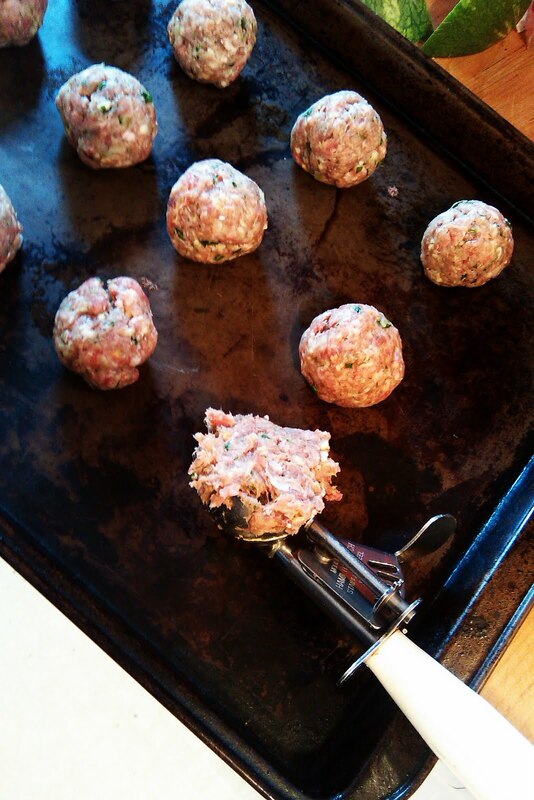 cookie scoop to measure out your meat balls. Lorelei and I had friends over the night I made this batch. I didn't really have time to cook the meatballs in sauce (instructions below), so I put them on a sheet tray and baked them in a 450º oven for about 10 minutes, then reduced the the heat to 350º for another 5 or 10 minutes. I made three balls per kid and it was just right. I had a fare amount of the mixture left, so I scooped more onto a sheet tray and put them in the freezer for another day. I'm happy to say that this turned out exactly as I had hoped. Yesterday afternoon (Saturday) I took a hand full of frozen meatballs and browned them up on a saucepan with about 2 tbsp. of olive oil. (Medium-high heat for 7 minutes or so) Then I dumped a jar of marinara sauce over the top of it and let it simmer with a lid on it for a couple of hours. We even went for a walk while it was simmering away. When we got back from our walk I boiled some spaghetti and served up the meatballs and sauce. CHEEEEZE or "Please Mama, can I eat my dinner now?" I'm always so pleased when Lorelei enjoys a meal that I have made for her. 1) I keep the frozen meatballs in dated freezer bags. I would recommend using them within a month or so. 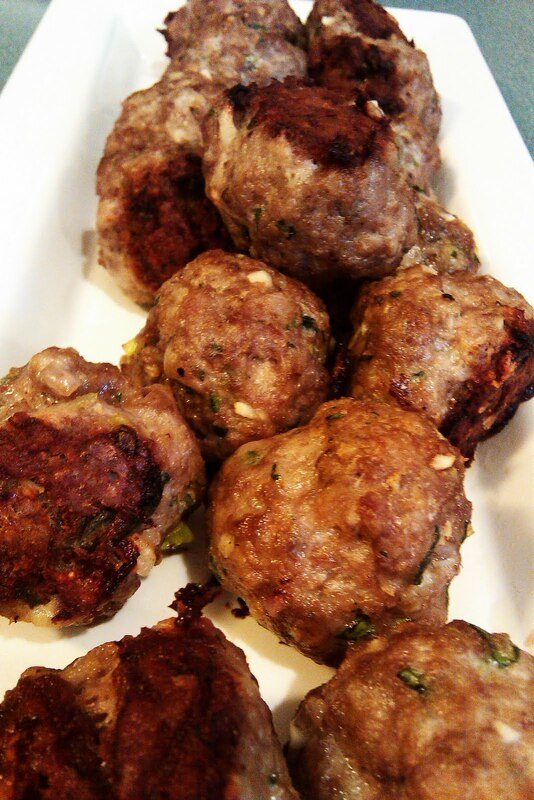 2) When baking meatballs from frozen, preheat the oven to 350º and bake for 35 minutes.